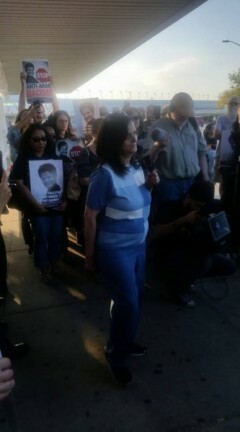 Hugs and tears as Rasmea Odeh deported | Fight Back! Chicago, IL — About 150 people gathered outside the international terminal, Sept. 19, at Chicago's O'Hare airport in support of Rasmea Odeh. The send-off rally was the last chance for supporters to say goodbye, as Rasmea was forced to depart the U.S. after an almost four-year legal and political struggle. Speakers applauded Rasmea and a defense campaign that put Israel on trial for its crimes, and lifted up the cause of Palestinian liberation.